Turtles and tortoises are some of the most long-lived members of the reptile family. Even small species that are typically kept as pets, like box turtles and terrapins, live between 30 and 40 years if they're kept healthy. Larger species such as sea turtles are estimated to live about 80 years. The giant tortoise, the largest of all land turtles, typically lives at least a century. Some have even been known to live for more than 200 years! There is no hard and fast answer for why turtles and tortoises live so long. There are, however, a few theories, including the slow rate of their metabolisms, naturally healthy lifestyles and evolutionary theories regarding reproduction. Of course, the longevity of a turtle's life depends on surviving predators, pollution and other environmental risks. New hatchlings are especially vulnerable to predators until their shells harden. As for domestic turtles, whether they live out the full extent of their natural lifespan depends largely on the type of care they receive. One reason turtles are believed to have such long lifespans is their slowness. Turtles continue to grow very slowly throughout their lives. This prevents them from aging in the same way birds and mammals do. Thanks to their slow metabolisms, they can survive long periods without food or water, which also gives them a greater chance of survival in harsh conditions. 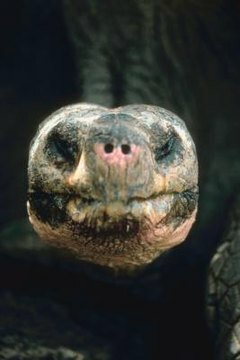 Another explanation is that the long lives of turtles and tortoises gives them an evolutionary advantage that aids in effective reproduction. Wild turtles tend to live in harsh environments that aren't always conducive to breeding. Their long lifespans provide them with more opportunities to procreate. Turtles also have natural protection from predators in their tough shells and thick, armored skin, which, unlike animals that tend to be prey, gives them the luxury of being able to take their time reproducing. The longest-lived of all the turtle species, the Galapagos giant tortoise, eats a strict vegetarian diet that's full of greens and free of fat and cholesterol. These slow-moving gentle giants are extremely docile and peace-loving creatures that generally live stress-free lives. This combination of calm and healthy living is likely another explanation for their extreme longevity. Pitara Kids Network: Why Do Turtles and Tortoises Live So Long? Slate.com: Why Do Giant Tortoises Live So Long?